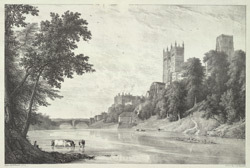 View of Durham Cathedral and its peninsula, probably taken from Prebends Bridge. This is one of the best position to show the imposing situation of the cathedral on the bailey peninsula above the River Weir. It shows the twin south towers of the cathedral and to the right is part of the castle. In the distance is the medieval Framwellgate Bridge and below the cathedral on the river bank is the old fulling mill.